I love all types of mushrooms , fresh or canned type. I bought a can of abalone mushroom some months back and last week , while looking through the kitchen cabinet, found a can of mushroom that is quite near to expiry date. I told WB that we must cook it straight away or we will have to throw it away. I have no idea what to do with it but thanks to WB 's suggestion to cook a vegetarian dish with it. 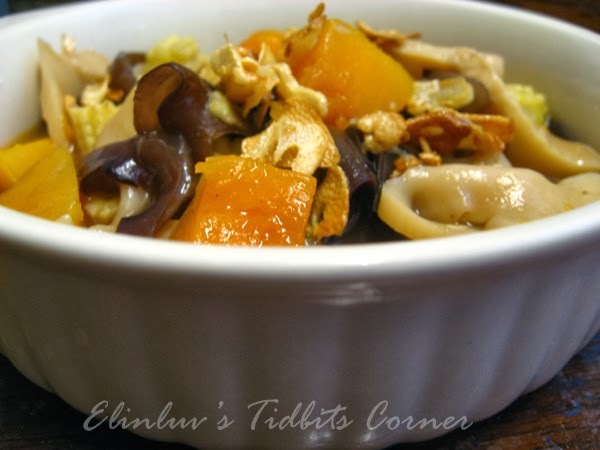 Luckily, there is still a wedge of pumpkin left in the fridge, some fresh baby corns, wood ear mushroom. With the addition of the abalone mushrooms, this simple stir fry dish looks impressive :) And of course it tasted good with some crispy garlic slices garnishing added to it. And what more it is a healthy dish. Saute garlic with a tbsp of oil in a non stick wok till fragrant. 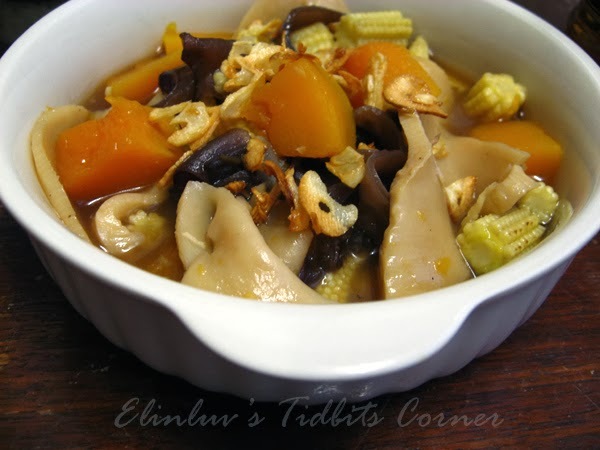 Add in the pumpkin cubes , fresh baby corns , abalone mushroom slices and fresh wood ear mushroom and stir fry till well combined. Add 1/4 cup of water and cover wok with lid and cook over medium heat. When the pumpkin, corns and mushrooms are cooked, add in the thickening sauce . When the gravy thickens, dish up and garnish with the crispy garlic slices and serve hot.